The picturesque four star hotel Posada del Gobernador ("Inn of the Governor") enjoys a perfect location right on the main square of the old town in the heart of the Historical District, within close walking distance of the main avenue and commercial center of the city, including shops, outdoor cafes and restaurants. 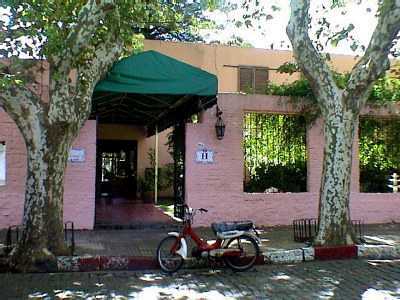 Built in 1981 on the grounds of the old hostería that was next door to the original Governor's House, the hotel has 15 rooms, all with views to the outside. In addition, all rooms have color TV, air-conditioning/central heating, minibar and private bath. There is also a swimming pool, 24-hour room service and a meeting hall for up to 75 people. The Inn has a permanent art exhibition of local artists in watercolors, oils, relief, graphite, etc. It also has on display a historical document dating back to the time of the original ruling caudillos and conquerors explaining the strategic importance of Colonia on the "River of Silver".